Beautiful fiery red sunset just outside the Dry Tortugas. 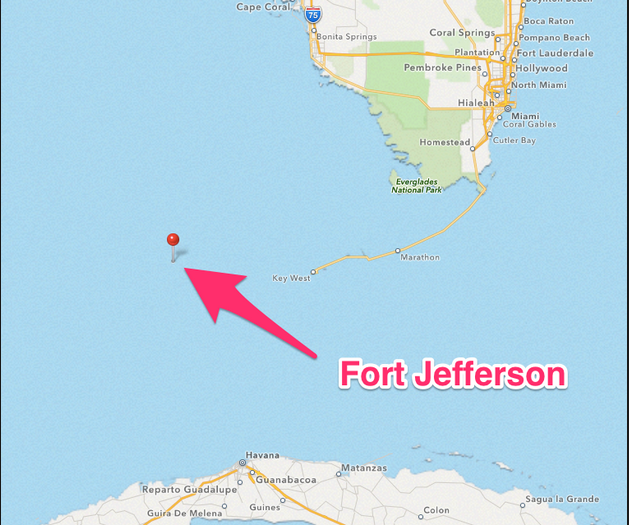 is Fort Jefferson at the Dry Tortugas National Park. Never enter a tricky anchorage at night is one of our cardinal rules. It's a basic safety issue. Yet Dry Tortugas, a good day sail from Key West, prompted us to break that rule for the first time. A few days past the shortest day of the year, we arose before dawn to be greeted by fog! Dawn view the morning of our Key West departure to Dry Tortugas. Along with visiting French territories at the outset of “Everything’s closed!” long weekends we’ve acquired a talent for finding ourselves enveloped by fog at the outset of key journeys. Or maybe it just seems that way. Both our Jacksonville cruising season starts (click here for more our December 2013 start, and here for our December 2014 start) began that way. Arrow marks Fort Jefferson, which is at the Dry Tortugas. The land mass at the top of the map is Florida; Key West isthe end of the gray line off and to the left of the peninsula of FloridaThe land mass at bottom of the map is Cuba. Unwilling to leave an unfamiliar anchorage dotted with derelict boats in semi-darkness (click here to see anchorage in daylight), we waited the extra half hour or so for enough light to penetrate, to demystify our visibility. 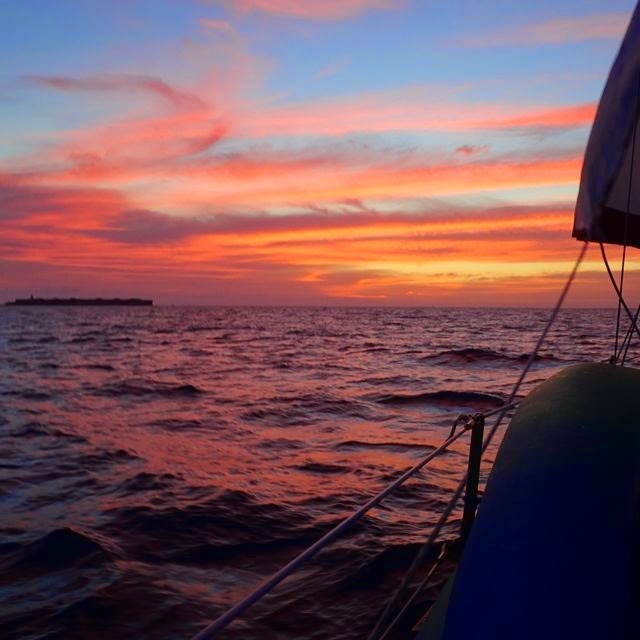 Nonetheless we were on track completing the 70 nautical miles with an arrival a little after 5 pm -- early enough to drop anchor and enjoy sunset in Dry Tortugas. We were already nearly halfway to the Dry Tortugas, past the turnoff to Boca Grande, and reticent to return to Key West. We knew at this stage we’d arrive near sunset. by that little anchor symbol to the lower right of the fort. 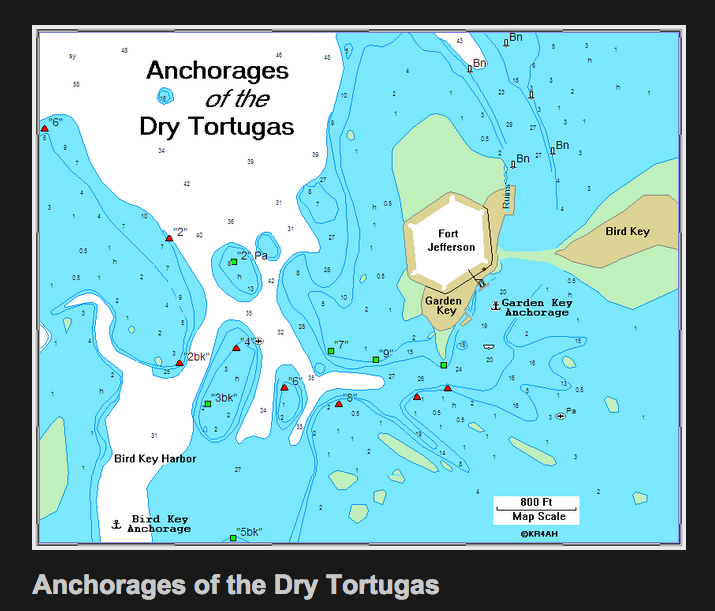 With light winds, and snagging two crab pot lines (clickhere to read about F---ing Crab Pots) we watched the sun set in view of Dry Tortuga’s Fort Jefferson -- but we were still a half hour away from dropping anchor in its protected park harbor. Wayne navigated the harbor ably, thanks in part to good advice from Ron of “Last Dance”, our neighbor in Boca Chica Marina. We dropped the anchor in the darkness, with Wayne resorting to using a flashlight to secure it properly. 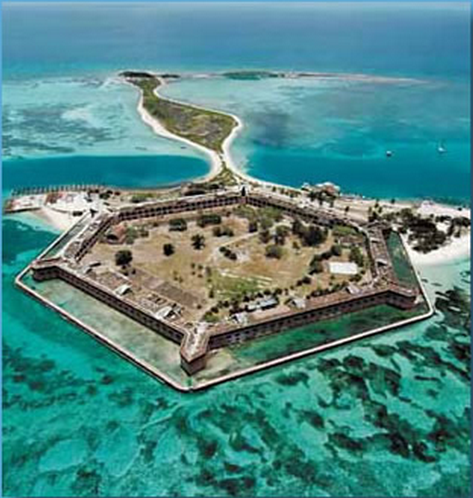 Arial view of Dry Tortugas with a Fort Jefferson as the focal point. At dawn, it appeared we’d anchored on the fringe of the channel’s entrance. Were we between the channel markers or outside them? We weren’t quite sure. 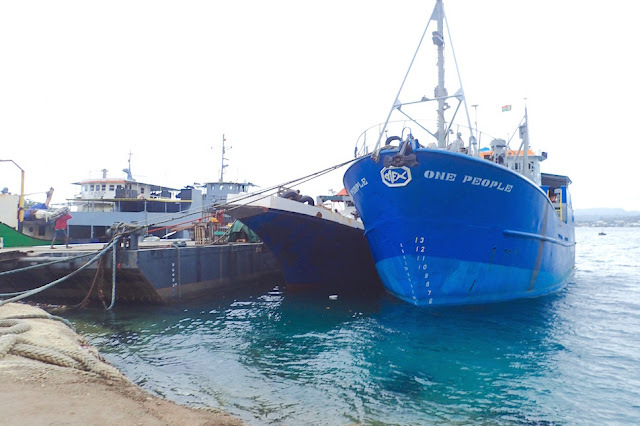 Perhaps getting buzzed by a few of the local fishing boats should’ve been our clue. Once we hopped into our dinghy to head over to the park, it was embarrassingly obvious. We were indeed inside the channel. That's a faux pas equivalent to parking your car far enough away from the curb to block the thoroughfare. We hung a u-turn, clambered back aboard Journey, and promptly re-anchored in a more appropriate spot. Rules are made to be broken. 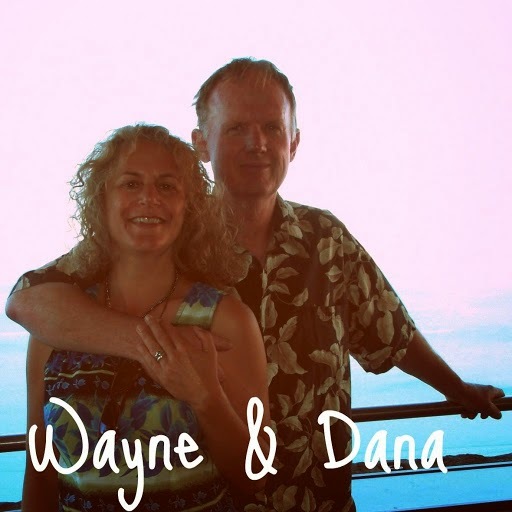 Yet, anchoring after dark in the Dry Tortugas provided a perfect example of why there are rules. 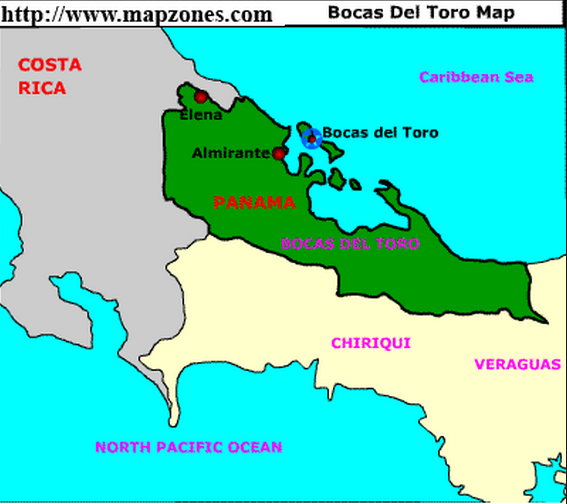 Currently, we are here, in Panama's Bocas del Toro province.